Synthesis of new polycation-stabilized gold nanoparticles was performed by the borohydride approach. 6,6-ionene was used as a polycationic stabilizer. The influence of several factors such as the acidity, the Au:ionene ratio and the concentration of sodium borohydride during the synthesis were investigated. The key role of the amount of HCl added during the synthesis on the behaviour of the products in time was shown. Optimal conditions for the synthesis were chosen. 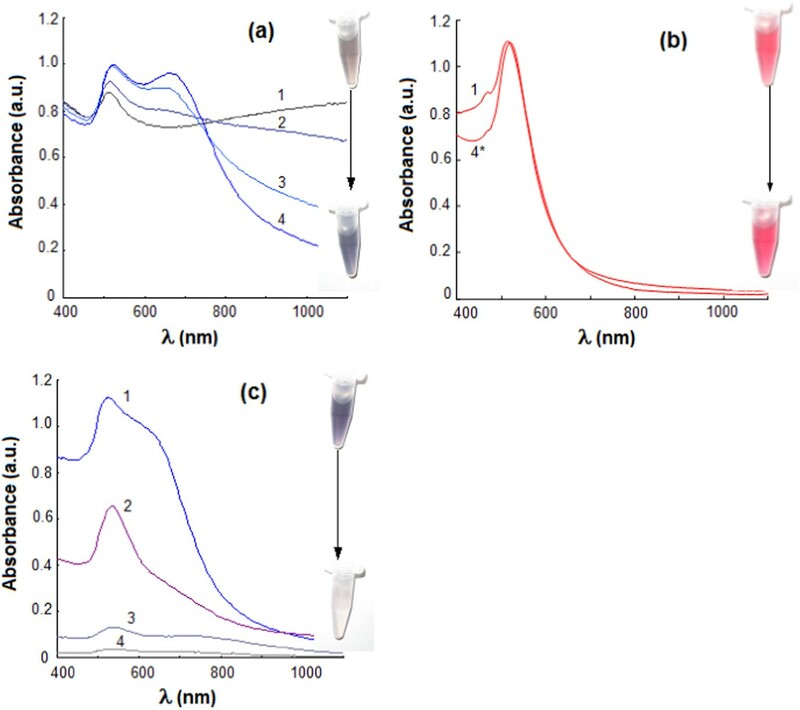 The prepared gold nanoparticles were characterized by surface plasmon resonance band at 520 nm. Their average diameter is 16 nm. Apart from spherical (73%), there were pentagonal (14%), hexagonal (7%), triangular (4%) and cylindrical (2%) nanoparticles. These particles were stable in solution for at least four months. Aggregative stability of the nanoparticles in the presence of different inorganic anions was tested. It was shown that the most aggregative effect was produced by sulfate, which reveals the prospects for use of ionene-stabilized gold nanoparticles for the selective detection of sulfate. These nanoparticles can be easily adsorbed on hydrophobic C8-silica, which may offer the way to new solid-phase nanomaterials for recovering and separation. 1. Introduction Recently, considerable interest of researchers working in various branches of science has been drawn to nanoparticles and other nano-objects of different kinds. A great part of the research work has been done in respect of gold nanoparticles (NPs) owing to their relatively high stability and unique properties which can be utilized in various applications [1Ц9]. Data on the application of gold NPs in the electrochemical and bioelectrochemical analysis [10, 11], chromatographic and electrophoretic methods [12, 13], chemical and immunosensors [14Ц18] have been published. Many different types of stabilizers/modifiers have been used for preparation of NPs with peculiar properties. Oligonucleotides, DNA, peptides, various thio-compounds such as cysteine, cysteamine, mercaptoacetic acid, antigenes, amino-compounds are among them [19Ц21]. The nature of stabilizing agent is an important factor, not only influencing stability of the synthesized NPs but also considerably affecting their properties. That is why the search for new substances prospective as the stabilizers or modifiers of NPs, synthesis and characterization of the new NPs is still of great importance. Ionenes are among such interesting substances. These are linear anion-exchange polymers described by a general formula (scheme 1). These compounds were suggested as effective stationary phases in chromatography and capillary electrophoresis [22Ц 24]. The presence of positively charged quaternary nitrogen atoms in molecules of ionenes in combination with the ability to form poly-layers with citrate-capped gold NPs  stimulated the interest in these polymers as effective stabilizers of gold NPs. Herein, we firstly present the method of synthesis of 6,6ionene-stabilized gold NPs, discuss several their characteristics and probable ways of further application. 2.1. Materials Hydrogen tetrachloroaurate, sodium borohydride, hexamethylenediamine, 1,6-dibromohexane, N,N-dimethylformamide, acetone, acetonitrile, sodium hydroxide, hydrochloric acid, sodium sulfate, bromide, chloride, perchlorate, chlorate, fluoride, nitrate, phosphate and hydrocarbonate, ethylenediaminetetraacetate disodium salt (EDTA) were used. All chemicals were at least of analytical grade. Silasorb S and silasorb C8 (10 µm, Lachema, Czech Republic) were used for investigation of NPs sorption properties. 2.2. Instrumentation Absorption spectra of the solutions were recorded by SF-103 spectrophotometer (Akvilon, Russia), pH was measured by Ekspert 001 ion meter (Ekoniks, Russia). Microphotographs of the samples were recorded, using transmission electron microscope LEO912 AB OMEGA (Carl Zeiss, Germany). Batch mode adsorption studies were carried out using LOIP LS-120 shaker. Centrifugation was performed on ELMI CM50 centrifuge. 2.3. Synthesis of 6,6-ionene 6,6-ionene (poly[N,N,-dimethylhexamethyleneimine hydrobromide]) was synthesized according to the following procedure. Equimolar solutions of N,N,NТ,NТ-tetramethylhexamethylenediamine and 1,6-dibromohexane were mixed in N,N-dimethylformamide up to the final concentration of each substance of 1 mol L-1. The mixture was stirred using a magnetic stirrer at room temperature until sedimentation of the polymer was completed. End point of the reaction was controlled visually by the volume of the sediment. The mixture was poured at stirring into 20-fold volume of water-free acetone. The sediment was filtered under suction and washed doubly with 10 mL of acetone. The product was dried under the vacuum of 10-2 mm Hg. The resulting powder was characterized by 13C and 1H nmR spectra. They are represented in figure 1, from which one can conclude that only four types of carbon atoms (at 21.74; 25.05; 50.28 and 63.84 ppm) consisting in a mole ratio of 1:1 to each other were present in the structure of the polymer. This fact corresponds to the presumed formula containing three couples of carbon atoms in the symmetric positions in the main polymer chain and a couple of side methyl groups. In 1H nmR spectrum, there are four strong signals (at 1.45; 1.80; 3.07 and 3.32 ppm, with the integrals of 2:2:3:2). The singlet at 3.07 ppm corresponds to two methyls, whereas the other signals belong to methylenes. These data also prove the structure given above. 2.4. Synthesis of 6,6-ionene-stabilized gold nanoparticles Gold nanoparticles stabilized with 6,6-ionene (NPs) were prepared by reducing metal salt precursor (hydrogen tetrachloroaurate, HAuCl4) in the presence of 6,6-ionene by sodium borohydride. Briefly, a 0.05 g portion of 6,6-ionene was placed in a round bottom bulb, dissolved in 18.5 mL of deionized water; 6.5mL of 0.1molL-1 HCl was injected at stirring. After that, 25 mL of a solution containing 1.25 mL of 1% HAuCl4 was introduced dropwise into the bulb. The brown mixture was stirred for 15 min. Then a solution of 0.025 g NaBH4 in 50 mL of water was added dropwise into the bulb with vigorous stirring. The color of the mixture changed to ruby. The solution was stirred for 30 min and kept for 24 h to achieve recrystallization and complete stabilization of NPs. The concentration of NPs in final solution was 70 µgmL-1 (0.35 mmol L-1 in terms of gold). The prepared gold NPs were characterized with UVЦvis absorption spectra, transmission electron microscopy (TEM) and electron diffraction (ED). 2.5. Studies of NPs sorption on hydrophobic and hydrophilic silica To investigate sorption properties of NPs the weighted 0.05 g portion of silica was taken. Silasorb S was activated with 5 mL of 0.001 mol L-1 solution of NaOH. Then it was separated by decantation and washed twice with distilled water. 0.5 mL of acetonitrile was added to improve wettability of silasorb C8. 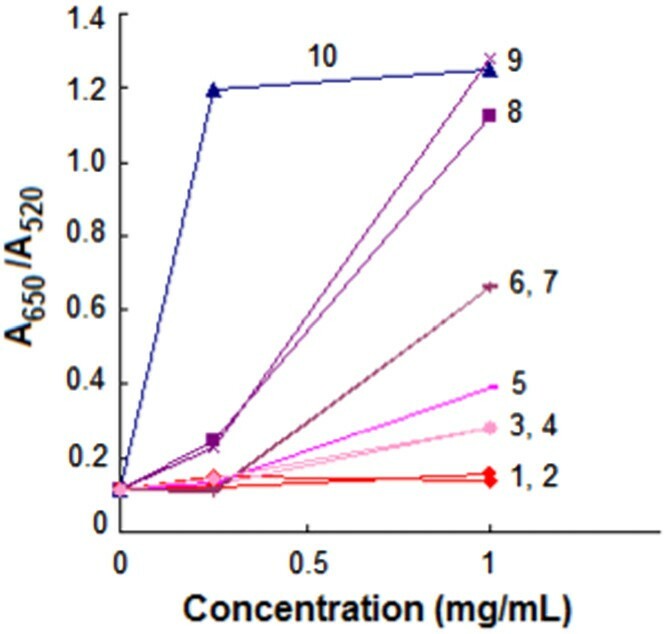 Batch mode adsorption studies were carried out by agitation of the sorbents with 10 mL of a solution of NPs of desired concentration at 25 ∞C for 15 min. The concentration of Au was varied in the range of 0.009Ц0.120 mmol L-1. The solution and adsorbent were separated by centrifugation at 200 rpm for 5 min and the concentration of residual NPs was determined spectrophotometrically at 527 nm, using a preliminary constructed calibration curve. 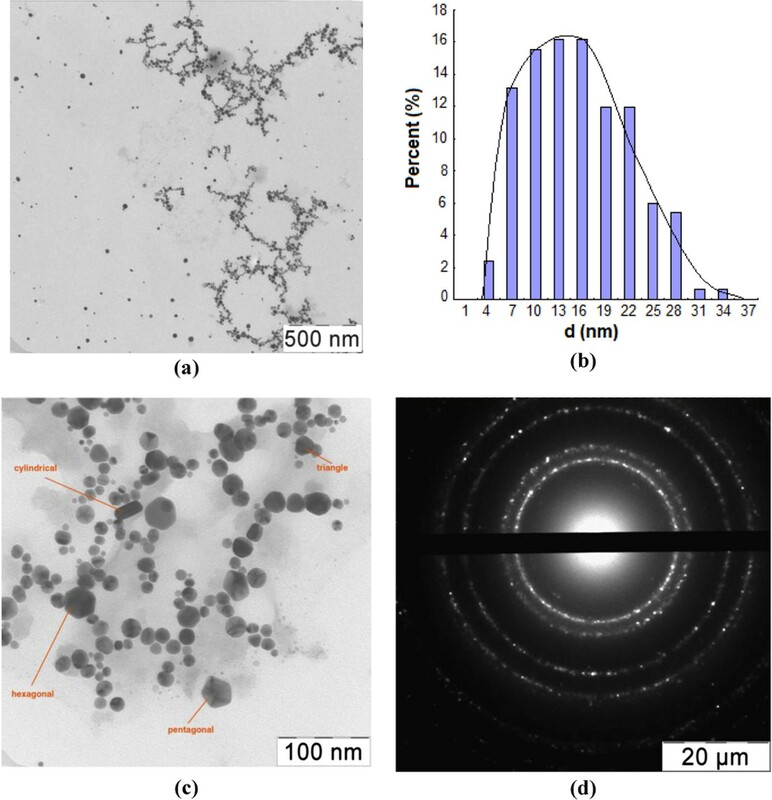 The amount of adsorbed nanoparticles was evaluated by the difference of their content in the solution before and after sorption. Figure 1. 13C (a) and 1H (b) NMR spectra of 6,6-ionene. 3. Results and discussion 3.1. Synthesis of 6,6-ionene-stabilized gold nanoparticles Due to the presence of well localized positive charges on the quaternary amino-groups of ionenes, these polymers are characterized by strong anion-exchange ability; long saturated hydrocarbon chainТs inserts impart conformation labiality to the polymer molecules as well as producing some sterical effects when interacting with other molecules or particles. These properties seem to suggest that 6,6-ionene appear to be a good stabilizer for gold NPs. The ionene-stabilized gold NPs are characterized by the surface plasmon resonance (SPR) band at 520 nm in water solution, which is typical for gold NPs of 10Ц25nm in diameter. Influence of several important parameters during the synthesis of NPs was investigated. 3.1.1. Acidity. Acidity remarkably influences the synthesis of NPs. It was adjusted by hydrochloric acid within the range of 0 to 20 mmol L-1. The resulting absorption spectra of the solution after synthesis are shown in figure 2(a). One can see that no pronounced SPR band was observed at the HCl concentration less than 4 mmol L-1. There was a well-shaped SPR band of NPs at the HCl concentration of 7Ц10 mmol L-1. At the concentration of HCl of 20 mmol L-1, the SPR band of individual NPs was accompanied with a band of the aggregates at 650 nm. The dependence of A650/A520 ratio (which characterizes an aggregative state of NPs) on the concentration of HCl is represented in figure 2(b). It has a minimum in the range of 7Ц10 mmol L-1 of HCl. The left part of the curve correlates well with pH of the solution (shown with a dotted line) that proves a key role of H+ ions in stabilization of NPs. Destabilization of NPs at the high concentrations of HCl, which appears as the increase of A650/A520 aggregative ratio, does not seem to be conditioned by H+ ions. It may be ascribed to the influence of Cl. (b) Dependence of A650/A520 ratio (solid line) and pH of the solution (dotted line) on the concentration of HCl. Figure 3. The A650/A520 ratio and the SPR band intensity at 520 nm of ionene-stabilized gold NPs depending on the Au:ionene ratio. . Being an anion, Cl. must interact with positively charged NPs causing their electrostatic destabilization. The concentration of HCl of 7 mmol L-1 was chosen as the optimal one and used in all further experiments. 3.1.2. The Au:ionene ratio. The Au:ionene ratio is another important factor affecting not only yield of NPs but also their stability. 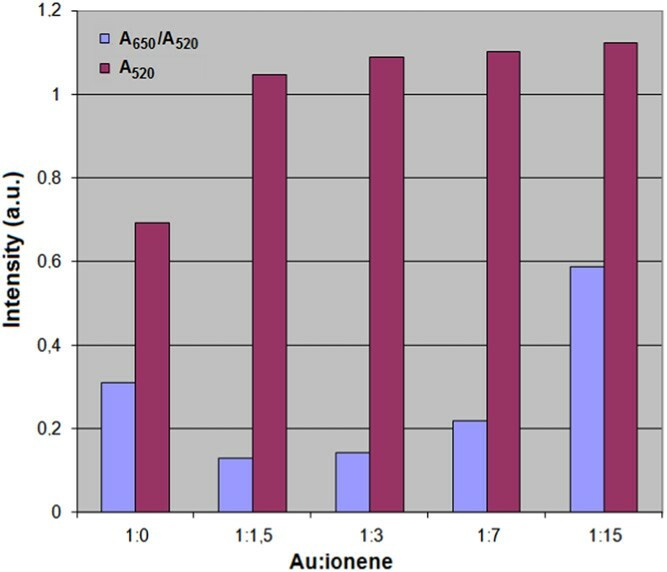 Figure 3 represents the influence of Au:ionene ratio on both these characteristics. It can be seen that the highest SPR band intensities at 520 nm were observed at the Au: ionene ratio more than 1:3, whereas the A650/A520 ratio was minimal at 1:1.5Ц1:3 of Au:ionene. Thus the ratio 1:3 was considered to be optimal and used in further experiments. Figure 4. Dependence of the SPR band intensity at 520 nm of ionene-stabilized gold NPs on the concentration of NaBH4. 3.1.3. The concentration of a reductant. This can be considered as one of the most important factors influencing the yield of a reduction product. We used NaBH4 as a reductant during the synthesis of ionene-stabilized gold NPs. The dependence of the SPR band intensity of NPs on the concentration of sodium borohydride is depicted in figure 4. According to it the maximum yield of NPs is achieved at concentrations higher than 5 mmol L-1. Figure 5. TEM image (a), histogram of size distribution (b), shapes (c) and ED pattern (d) of ionene-stabilized gold NPs. 3.2. Characterization of 6,6-ionene-stabilized gold nanoparticles The presence of NPs in the solution was proved by electron microscopy. As can be seen from microphotography (figure 5(a)) and histogram of size distribution (figure 5(b)), NPs had the average diameter of 16 nm. Close consideration of the TEM images shows that NPs are polymorphic: spherical (73%), pentagonal (14%), hexagonal (7%), triangular (4%) and cylindrical (2%) nanoparticles were present in the sample (figure 5(c)). Electron diffraction pattern of the particles (figure 5(d)) confirmed that these nanoparticles were gold NPs. 3.2.1. Time stability. The stability of ionene-stabilized gold NPs in time has been investigated. It is interesting that NPs synthesized in the presence of the different concentrations of HCl had different behavior in time. This becomes clear from figure 6. The NPs samples obtained at the low (4 mmol L-1 HCl) and high (20 mmol L-1 HCl) acidity are both instable. But these kinds of instability are quite different. Figure 6. Absorption spectra of ionene-stabilized gold NPs prepared in 4 mmol L-1 (a), 7 mmol L-1 (b) and 20 mmol L-1 (c) HCl in 1h (curve 1), 5 h (curve 2), 25 h (curve 3), 78 h (curve 4) and 4 months (curve 4*) after the synthesis, and the colors corresponding to the marginal situations. At the low acidity (figure 6(a)), the absorption spectrum of NPs recorded in 1 h after the synthesis had no pronounced SPR band of NPs at 520 nm but contained a long-wave tail at . > 1100 nm. Keeping the solution for several hours resulted in decreasing the long-wave tail and increasing two bandsЧat 520 and 650 nm, which corresponded to individual NPs and their aggregates, respectively. Color of the solution changed from gray to blue. The presence in the spectra of an almost isobestic point at 750 nm may prove that the total amount of nanogold in the solution is not changed. These facts seem to be attributed to re-crystallization processes with participation of NPs taking place in the system. At the high acidity (figure 6(c)), one could observe a quite pronounced band of NPs and their aggregates 1 h after the synthesis which then was decreased. It may correspond to enlargement and sedimentation of the NPs aggregates. 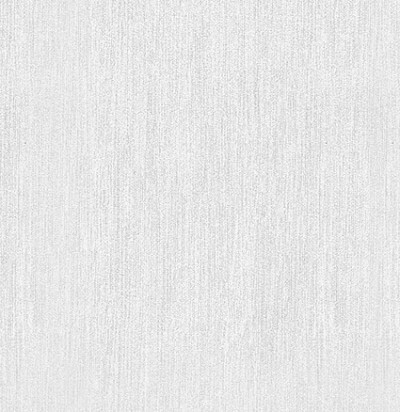 Color of the solution was changed from blue to light gray. The NPs prepared at 7 mmol L-1 HCl were stable for at least four months (figure 6(b)). 3.2.2. Aggregative stability. The aggregative stability of ionene-stabilized gold NPs in the presence of different inorganic anions and EDTA has been estimated. Aggregation of NPs was estimated as A650/A520 aggregative ratio at the two different concentrations of anions of 0.25 and 1.0 mg mL-1. The results are represented in figure 7. One can see that the most aggregative effect was produced with sulfate followed by EDTA and nitrate. This fact may be explained by the decreased polarizability of these anions. In the case of sulfate, this is accompanied by its increased charge, which is equal to .2 in the wide pH range. It imparts to this anion the additional ability to produce the aggregation of NPs, owing to 6 formation of crosslinking between them. All these facts make ionene-stabilized gold NPs prospective for the selective detection of sulfate. Figure7. Influence of the nature of an added anion on aggregative stability of ionene-stabilized gold NPs at the 0.25 and 1mgmL-1 concentration level. Added anion: dihydrophosphate (curve 1), perchlorate (curve 2), chlorate (curve 3), hydrocarbonate (curve 4), fluoride (curve 5), bromide (curve 6), chloride (curve 7), nitrate (curve 8), EDTA (curve 9), sulfate (curve 10). Figure8. Isotherm of [NPs] adsorption on silasorb C8. mSilasorb = 0.05 g, V = 10 mL. 3.2.3. Adsorption properties. 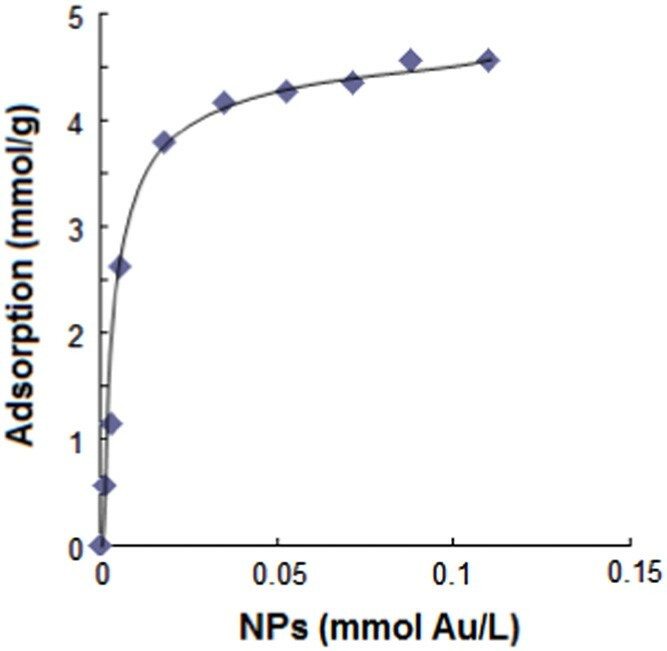 The adsorption of ionenestabilized gold NPs from aqueous solution on the hydrophilic sorbent silasorb S and the hydrophobic sorbent silasorb C8 has been studied. It was shown that the sorption on silasorb C8 could be described by the classical Langmuir isotherm of monomolecular adsorption (figure 8). The maximum adsorbed amount of NPs was 5 mmol Au g-1. The adsorption of NPs on silasorb S was significantly lower (<1 mmol Au g-1). The isotherm had irregular form, which could be a result of multilayer adsorption. Thus, the ionenestabilized gold nanoparticles have certain hydrophobicЦ hydrophilic balance that can be utilized in the synthesis of new adsorbents for recovering and separation of moieties of different polarity. 4. Conclusion It has been stated that 6,6-ionene polycation is a promising stabilizer for the synthesis of gold NPs. The optimal conditions of the synthesis have been evaluated; they were achieved in 7 mmol L-1 HCl, at 1:3 Au:ionene mol ration, in 5 mmol L-1 solution of NaBH4. The important influence has been revealed of the concentration of HCl during the synthesis on the stability and behavior of an СNPsЦ their aggregatesТ system. NPs prepared under the optimal conditions are characterized by the average diameter of 16 nm and an SPR band at 520 nm, being stable for at least four months. Aggregation of NPs under the influence of anions has been shown to depend on the nature of the anion. Sulfate causes the highest aggregative effect, which is prospective for its selective detection. Good sorption ability of NPs regarding modified silica sorbents offers the way for their application in synthesis of new solid-phase nanomaterials for recovering and separation. The work was financially supported by the Russian Foundation for Basic Research (grants N 13-03-00100, 14-0331109). We also thank MSU Joint Use Center and Dr Sergey S Abramchuk for recording TEM images and ED patterns of the samples.